Overlooking the South Pacific Ocean to the Poor Knights, Tawahi is central to Kauri Mountain, Ocean Beach, Whangarei Heads and Mt Manaia. There are a dozen beaches within as many minutes and Parua Bay village is just a short drive in this area of outstanding natural beauty. Tawahi combines good design and eco-friendly materials with great craftsmanship to create a clever, comfortable and contemporary space in which you can kick back and relax. The road up to Tawahi provides unsurpassed views of Whangarei Heads, Ocean Beach and the Eastern side of Mount Manaia. 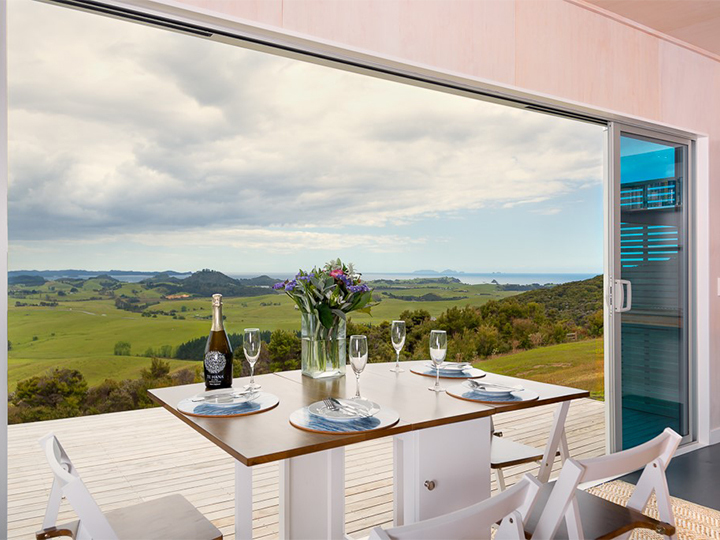 This is a truly special place beautifully positioned to optimise the sunshine and see it all, yet within just a few minutes’ drive of the cafes and shops of Parua Bay. The steep bush is home to Fern birds, Harriers, Swallows and you may even hear local wild Kiwis call at night.